Discussion in 'Tanks' started by timwis, Apr 15, 2019. 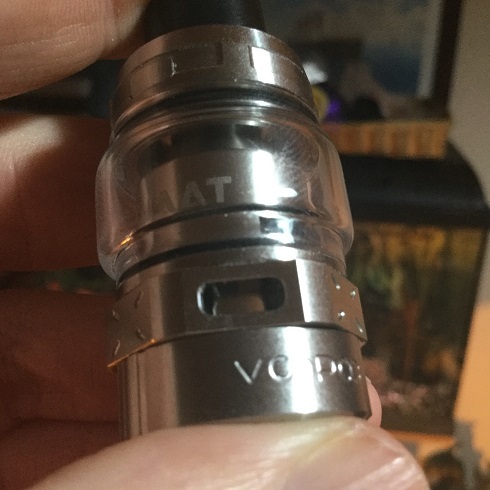 Hi Vaping Underground members, In this review i take a look at the Maat Sub-ohm Tank from Voopoo. 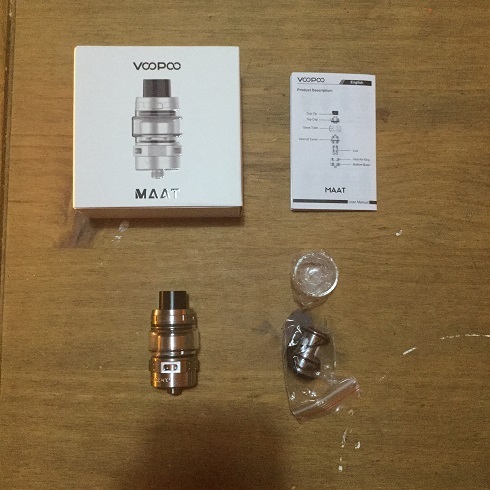 The Maat Sub-ohm Tank was supplied for the purpose of this review by Thea from Voopoo. 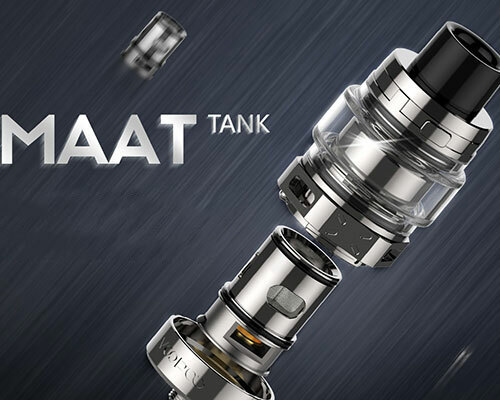 Some hype surrounding this tank as we see a brand new way of delivering bottom airflow on a Sub-ohm tank along with other features making the Maat "Middle Adjustable Airflow Tank" a really interesting tank to test. 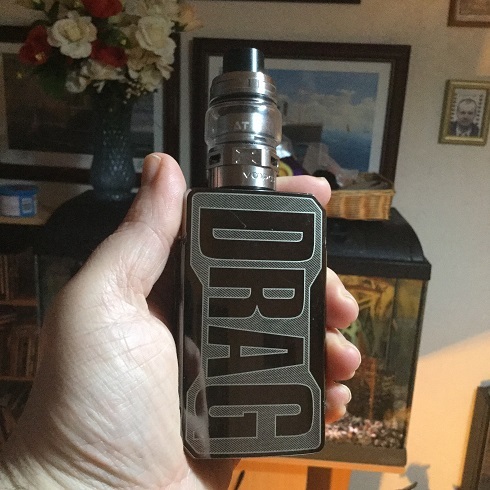 Voopoo also sent the Drag 2 Platinum edition to test the Maat Tank with which i will not be concentrating on as i have reviewed the Drag 2 but you will see from pictures in the review the Platinum version looks stunning (well it does in my opinion anyway). 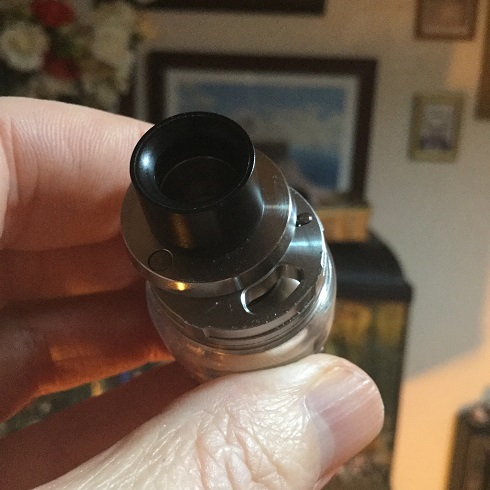 As well as the airflow inlets not being right at the bottom of the tank avoiding getting leaking e-liquid going onto your device, the coils can also be swapped out with e-liquid still in the tank. The Maat also features a hidden juice reservoir under the visible glass section of the tank to help those that tend to let their juice level run low before filling getting dry or burnt hits because they have let the tank run too dry. 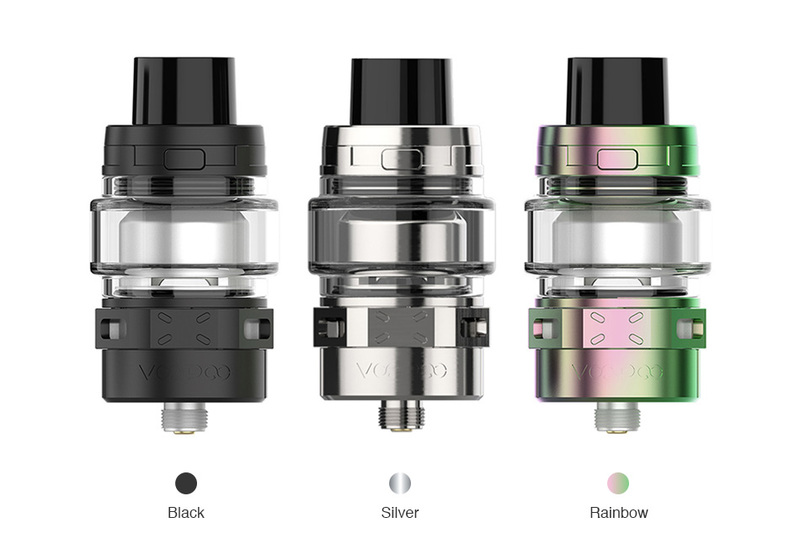 Coming pre-installed with a 4ml bubble glass (standard edition) or 2ml straight glass (TPD edition) the Maat Tank is more than worthy of a good look! 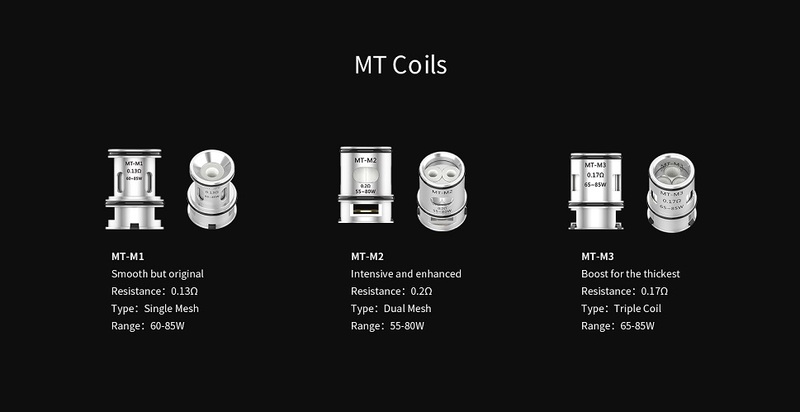 We see brand new designed coils for the Maat (the MT coils) and already a third coil has been released before the tank has hit the shelves which includes the original 2 coils so no doubt more coils will be available in the future. 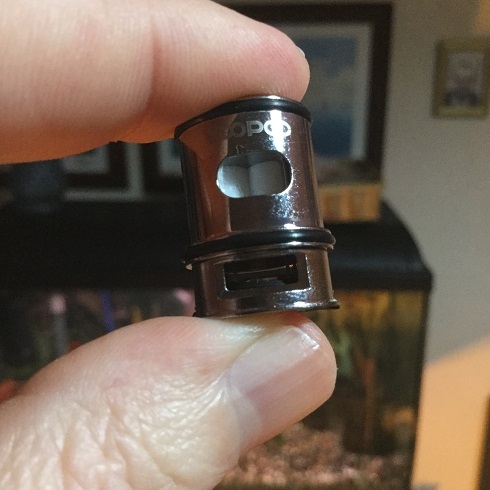 The coil heads are very unique looking and quite some size because as well as housing the coil/coils also the bottom section mimics the airflow intakes you would get on the base of the tank that feeds the coils in the same way. Pre-installed is the MT-M2 coil which is a dual mesh with a resistance of 0.20ohm, this coil is rated between 55-80W. The other included coil is the MT-M1 which is a single mesh coil with a resistance of 0.13ohm, this coil is rated between 60-85W. 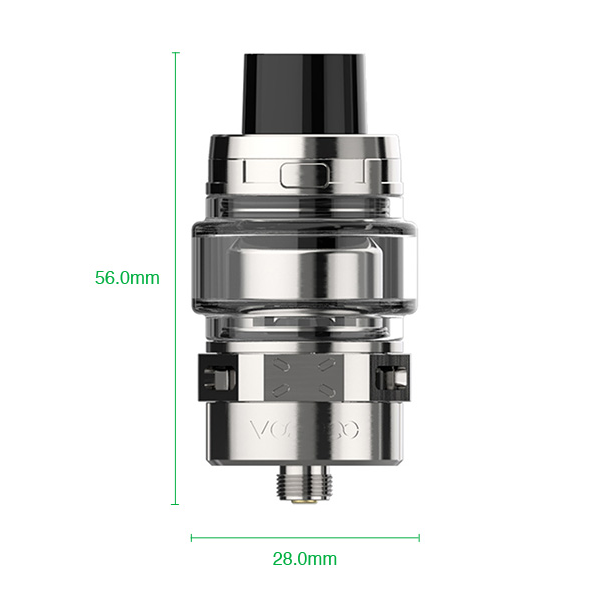 Voopoo also sent the third available coil which doesn't come with the tank which is the MT-M3 which is a triple mesh coil with a resistance of 0.19ohm and rated between 65-85W. The base section unscrews from the tank revealing a large casing, housing or chamber (what's in a name) for the coil to just get press fitted into. It's a snug fit and everything gets sealed nicely with o-rings. 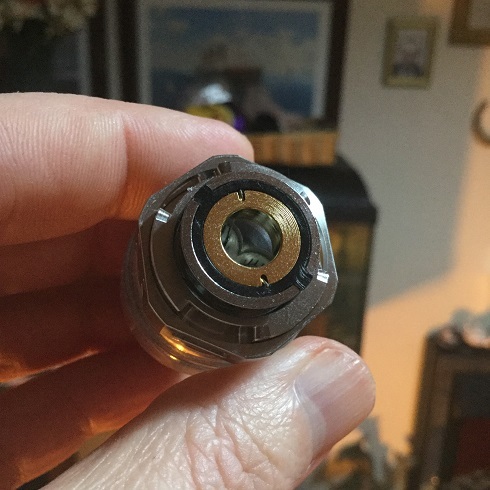 The coil gets fed e-liquid via horizontal slits in the casing (or whatever you prefer to call it) at the bottom of the glass section so when holding the tank upside down to change the coil it's a mess free operation even with a tank of liquid. As well as feeding the cotton to keep it saturated their is a small reservoir that gets fed (when fitting a coil turning the tank upside down allows the liquid in the reservoir to go back through the slits into the main tank), this gives you just a bit extra juice you can't see. The idea behind this reservoir is that some people let the juice run right down before filling and can misjudge it sometimes and get dry and burnt hits, this gives them an extra buffer. The idea gets a pro but i think those that run the juice low once they realise they have this buffer will start relying on it and still end up getting dry and burnt hits (nothing wrong with the idea though). 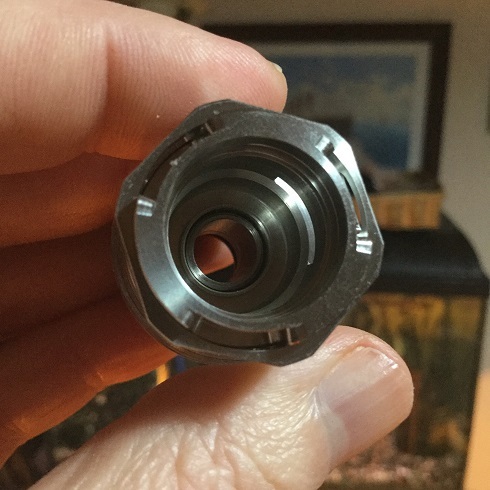 As i am now going to be covering the top section of the tank it's a good time to point out the tank has a proprietary sleeve drip tip which is rather comfortable but a con as most people including me want to have the option of being able to use a different drip tip. The Maat has top-fill and childproof design, on the side is a button that actually took me a while to find and is somewhat hidden in the design as well as sitting flush. Actually the fact it's not that easy to see until you know where it is and it can't be felt because it sits flush is a big pro as that's the whole point, it's a childproof feature and on some tanks i have seen the same feature with a very visible protruding button basically saying push me! When you press the button the top springs open with a slight rotation, it really is a sleek design. The fill port is a fair size but because the coils casing or chamber takes up so much room you can't get your nozzle far inside and you have to fill slowly else it can get messy, also there is no added hole for air to escape, so either take your time or use bottles with thin nozzles. 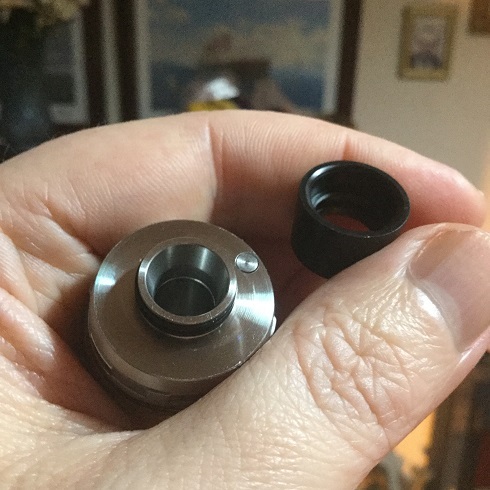 Also the top-cap only opens just enough to allow for filling so the large proprietary drip tip gets in the way when trying to fill using chunky bottles, still a bit of class the way the top-cap springs smoothly open when pressing the button, very nice! The Airflow on the Maat is innovative so much so the name of the tank is made up of the initials of the airflow system. 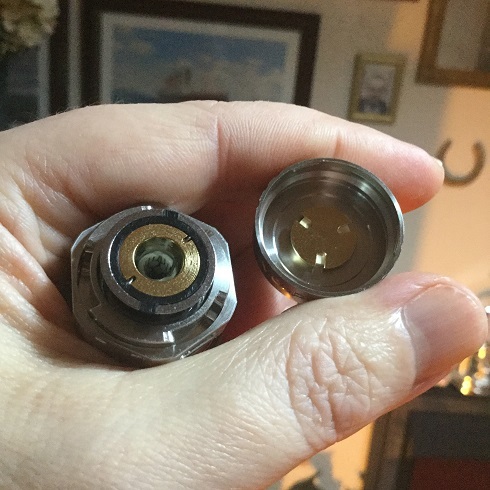 The airflow inlets and airflow control ring is above the base rather than on the base so any liquid that could find it's way into the base section has no airflow slots to escape out of and onto your device, it's really the same idea as top to bottom airflow we have been seeing a lot on mainly single coil RTA's still giving bottom airflow but entering the tank through top airflow inlets making it a leakproof design. 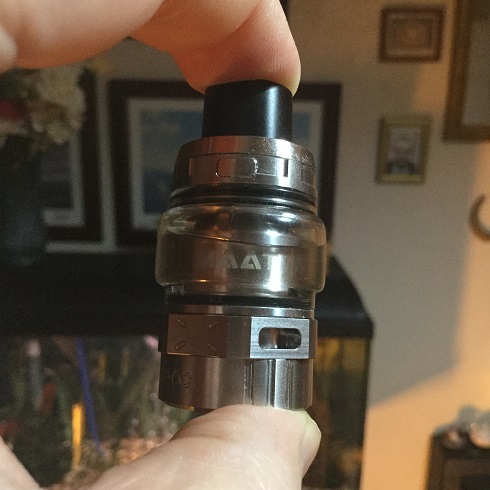 Why we don't see this often on sub-ohm tanks i can only guess is the loss of air pressure travelling from the top to the bottom effects the airflow in a negative way although we have seen some recent genius designs with RTA's that overcome this but possibly wouldn't have the same results with tanks that use pre-built coil heads. With this design any loss of pressure as really been took out of the equation as the airflow inlets have only been moved up slightly above the base, we have tri-cyclops that can be adjusted in the usual way. Inside the tank we have casing for the coil head to be press fitted into, this casing also has 3 cutouts on the outside of the wall that doesn't penetrate all the way through the casing. The top of these cutout sections line up with the airflow inlets on the control ring and act as cavities so the air comes in through the airflow inlets then down these cavities and feed into the bottom section of the coil head that mimics the usual base airflow setup giving bottom airflow just as if it had been delivered in the usual manner. I actually have been using the tank yesterday and today to try out the third coil that was sent to me, i fully tested the tank out over a week ago while i used it for a week while also testing other products but Voopoo wanted me to try the third coil before writing the review. I have to be honest though the coil that held writing the review up was my least favourite, it's the triple mesh MT-M3 which is rated between 65W-85W yet for me this was best below that rating at 60W, the flavour was very good but this coil seemed to have a lot less flavour range than the ones that come included with the tank, much below the 60W sweet spot and the vape was rather weak but much over and it was the only one of the 3 coils that did seem to threaten a dry hit when chain vaping, don't get me wrong i got on with all three coils and all gave great flavour but this was my least favourite. The pre-installed MT-M2 was my preferred choice and i settled for 70W but this had such a good flavour range giving very good flavour from 60W right up to 85W but at this wattage i found the tank was getting a little toasty for my personal liking. 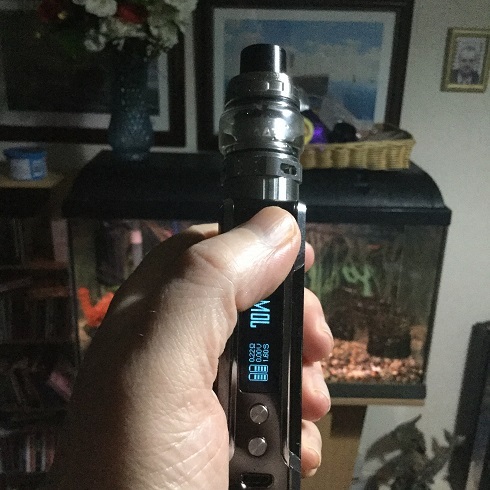 The MT-M1 which was the other included coil i also liked and again gave a good flavour range but over 70W gave a vape too warm for me but full of flavour, i preferred this coil running at a slightly cooler 60W. Having the airflow inlets set above the base section has done the Maat no harm, i did wonder about loss of pressure or would it cause turbulence but quite the opposite the Maat has enough air for most with just a slight restriction, and the air being channelled down to the bottom of the coil seems to smooth it out because the Maat's airflow is super smooth. 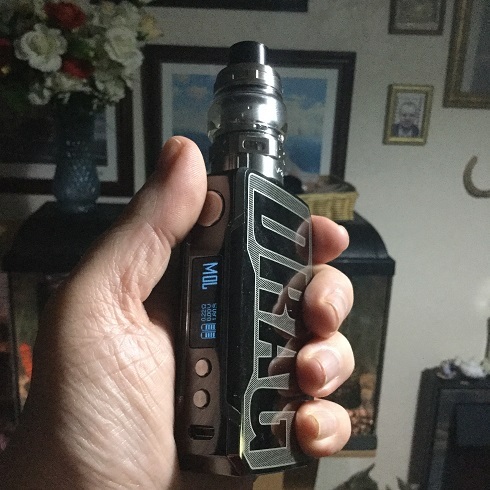 Any noise from the tank is from the coil which isn't drowning out the noise of the draw as the draw is silent, it gives a very smooth enjoyable vape. I will end with a pro and a con, having the airflow control above the base section makes it so much easier adjusting airflow while it is on your device and it moves smoothly but when adjusting i did notice the tank gets quite hot. 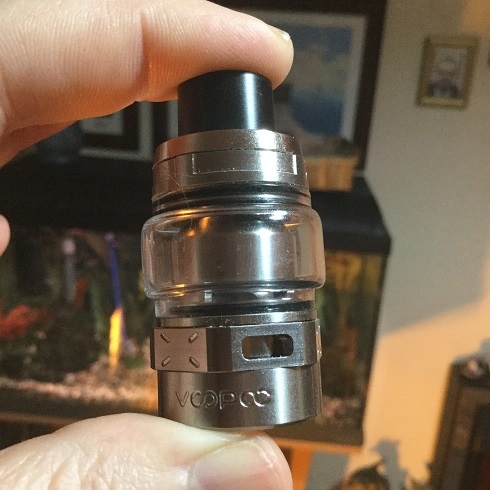 This is one hyped tank that is worthy of any hype, it gives cracking flavour, silky smooth airflow and has some other great features with any cons being quite petty and/or objective. 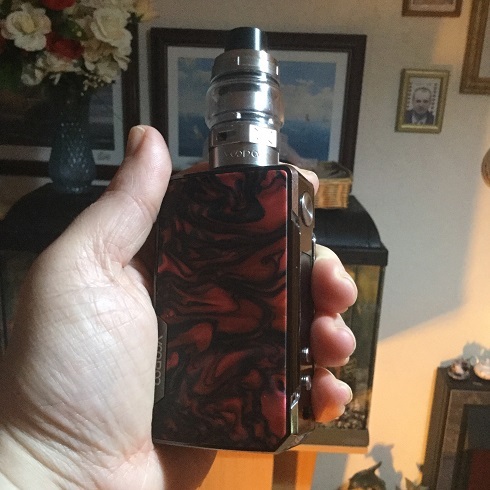 I have a Voopoo kit that i'm about to start testing which includes the Maat so this one now will be used along with other products for another week but that won't be any great hardship! 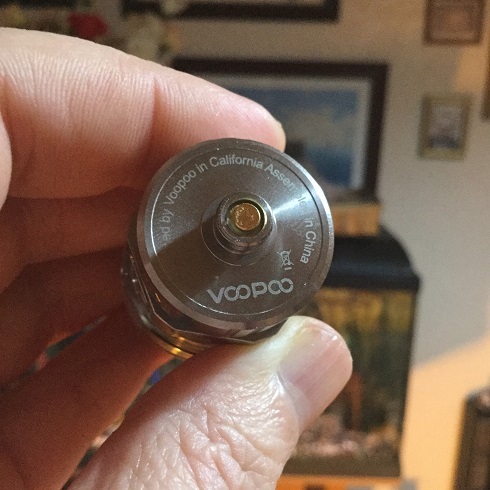 I would once again like to thank Thea from Voopoo for supplying the Maat Sub-ohm tank for the purpose of this review.